Begin at G38 GR 429723. 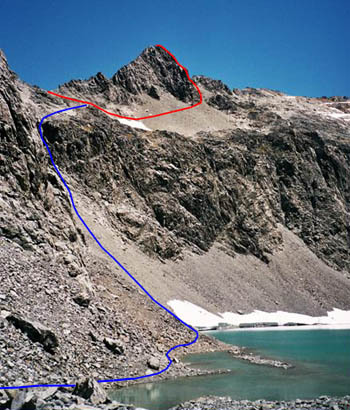 Commence the ridge via a weakness in the bluff (ledge or easy gully) to reach the broad tussock ridge at about 1300m. Gain height on the ridge turning steeper sections on the SE until reach 2000m. Cross ridge to NW to reach top basin, traverse the snow and scree, and scramble rock pyramid to summit. The kumara shaped tarn can be reached by descending the bluff below the upper basin, or by traversing from 1900m on NE ridge to just above the tarn outlet.